The FDA has given the green light to Axcan Pharma, Inc. to market the drug Pylera for the treatment of H. pylori (Helicobacter pylori). H. pylori is a bacterium that causes gastric and duodenal ulcers. 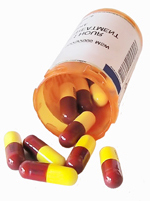 Each capsule contains biskalcitrate potassium, metronidazole and tetracycline hydrochloride. The patent expires in December 2018.